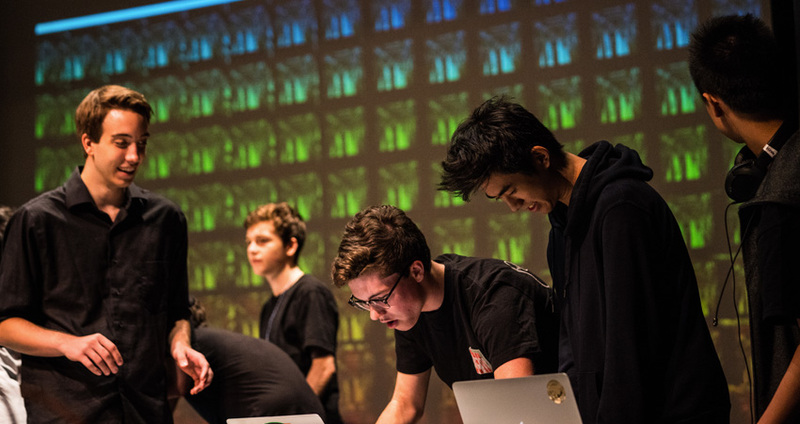 The Meridian, part of SEMI, at work during the Steinhardt Music Technology program’s summer Music Tech Performance. Photo courtesy of NYU Steinhardt. On the afternoon of July 13th, attendees arrived at the Frederick Loewe Theater on West 4th Street for the Music Tech Performance, the final component of a two-week long summer program at the Steinhardt Department of Music and Performing Arts Professions. The audience included the parents of pre-teen and high school musicians, who had been preparing for this day during the preceding two weeks. The three groups performing during the event — the Girls Electronic Music Stars (GEMS), the Summer Electronic Music Institute (SEMI), and the Summer Institute of Music Production Technology (SIMPT) — each embodied different core focuses and requirements that they then showcased onstage. Using concepts and technologies they learned during their week in the program, the 12 GEMS students performed a series of nine songs. Many of the compositions used recordings of the students’ own voices, which were then manipulated and altered to sound like a new kind of instrument. Using technology provided by Steinhardt, they created voice-based music that differed from the more commonly-known, vocally-focused a capella. 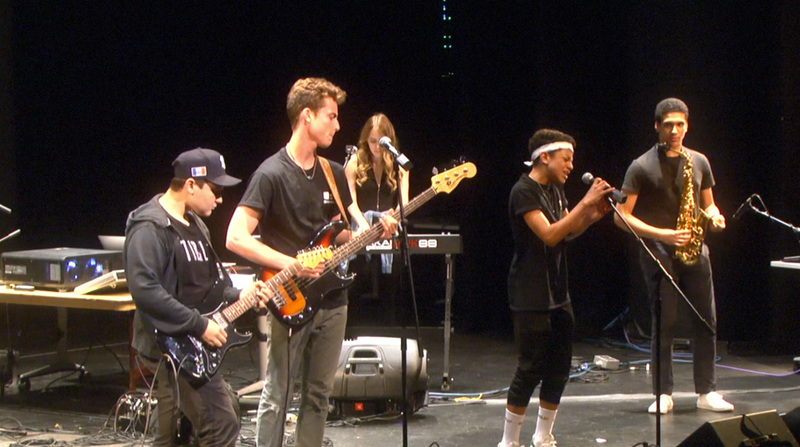 The students opened their set with the song “Spoken Word,” during which they dubbed themselves “music magicians,” while emphasizing that “music is an escape from reality.” The following number, “I’m Leaving Tomorrow,” heavily featured the titular phrase punctuated by beats, clicks, and a series of their own recorded giggles. Some songs’ themes were reflective of the empowering environments into which the young students had been immersed. Each song echoed a theme of “girl power.” One song emphasized the importance of supporting other females as a team, featuring the lyrics, “we come together because we are powerful together.” Another listed the many terms the GEMS girls use to describe confidence in themselves — “proud artists, powerful, creative, artistic, [and] awesome.” As they belted out the bold lyrics of their songs, the GEMS girls also played instruments provided by Steinhardt’s Music Tech department. While some fingers tapped on a large, padded box covered in tiles, others tapped on an electronic drum, and still others created beats by sending ripples over various shades of Jell-o. Young performers from GEMS. Image courtesy of NYU Steinhardt. 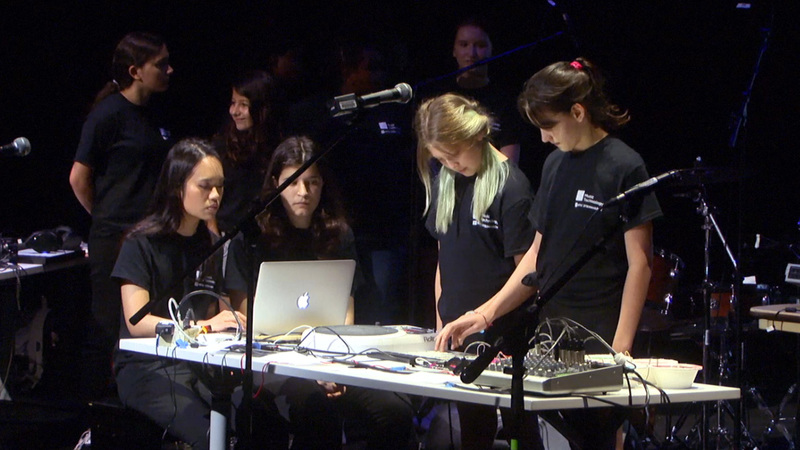 GEMS’ performance was followed by acts representing the Summer Electronic Music Institute (SEMI). The songs varied in both length and lyric saturation, some focusing on the core words and others featuring no language at all. SEMI, attended by high school juniors and seniors, is focused on “production skills and enabling live electronic music composition, improvisation and/or performance.”2 It is designed for aspiring electronic musicians and electronic dance music (EDM) producers, and immerses students in lectures, workshops, labs, and group projects for two weeks. The first group from SEMI, TBD, began their performance with their song titled “ERR.808_DENALI_NOTFOUND.” Led by a girl singing through a deep-voiced synthesizer, TBD’s music had a futuristic-sounding quality and was paired with a unique video accompaniment. Following TBD was the Meridian’s “Sub-Marine,” a song full of dramatic build-up moments followed by drops, channelling the style of dubstep music. Two other groups closed the SEMI performance: DLay and HTWV. DLay’s “Denali” had a somewhat dystopian vibe, punctuated by the loud, steady beat of an electronic drum. This song was accompanied by overhead video footage of a bluish, snow-covered forest that slowly began to pulse yellow in time with the beat. “Tumbling,” by HTWV, was led by a girl whose voice is comparable to that of Ellie Goulding, singing “Lift me up before I fall and tumble down.” As the upbeat song played through, the lead singer’s face broke into a smile, exuding the passionate creativity these students are able to explore through the SEMI program. DLAY perform “Denali,” a part of SEMI’s portion of the concert. Photo courtesy of NYU Steinhardt. The students participating in the GEMS, SEMI, and SIMPT programs had the chance to learn from NYU professors and be mentored by Steinhardt undergraduate and graduate students in the Music Technology department. 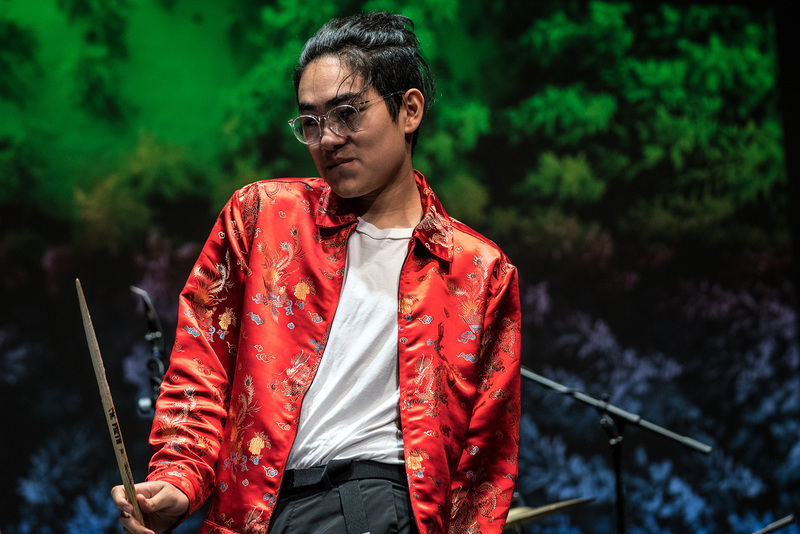 Music Technology graduate student, Parichat Songmuang, values the opportunity to assist with the summer programs because the interaction with new people and technologies helps broaden the knowledge base of those pursuing degrees. Nomad perform “Getting Out,” part of SIMPT’s portion of the Summer Music Performance. Photo courtesy of NYU Steinhardt. The final act of the performance involved students participating in the Summer Institute of Music Production and Technology (SIMPT) program. This program is open to high school juniors and seniors with the ability to play an instrument or sing. For two weeks, these students “focus on all of the aspects of contemporary music production”3 and recording. They also learn more about this multifaceted field through artistic angles, including sound effects editing, field recording, mixing, and scientific subjects, as well as hearing and the physics of sound. Through labs, tutorials, workshops, and lectures, students receive a well-rounded overview that they then use to create their own music over the course of the program. The sound and tone of SIMPT’s music was very different from that of GEMS and SEMI. GEMS’ music had solemn melodies with empowering messages. SEMI’s music tended to sound either dystopic or dubstep-adjacent, only occasionally featuring words. SIMPT’s music featured traditional instruments with little apparent electronic manipulation, greatly differing from the concert’s first two acts; likely due to the different focus of this program’s lessons. The opening SIMPT group, Nomad, played their song “Giving Out” on a well-lit stage that contrasted with the dim stages of preceding acts. Unlike previous performances, Nomad also began SIMPT’s string of more traditional music with a song featuring trombone and electric guitar. The next band, Pineapple Fox, performed, “Lonely,” which featured an assortment of instruments that ranged from a ukulele and guitar, to drums and a keyboard. As the beat progressed from melancholy to cheerful, the lyrics evolved from “Trying to find peace of mind/Just a little bit lonely,” to “Feeling safe, then sound/Can’t stop me now/Found somebody to hold me.” The positivity of the lyrics paired with the calming beat and tropical-sounding ukulele juxtaposed someone healing emotional wounds at the speed with which one rejuvenates on vacation. “Lonely” was followed by “Mr. Yums Hot and Ready Ice Cream” by the group, Mr. Yums. The arc of “Mr. Yums” opposed that of “Lonely,” starting with an upbeat and energizing tune, then falling into a repetitive and almost eerie keyboard, cello, and electric guitar combo. The placement of Mr. Yums’ performance after Pineapple Fox’s showed the wide range of lessons these students were exposed to, as the two songs demonstrated similar skills and levels of knowledge in completely different ways. The closing performance was “Confusion” by Sub Cellar 6. This song opened with a catchy saxophone solo as the lead singer danced with uninhibited energy before breaking into a chorus of “the mess you left inside my head/I’m stuck in the middle of us.” This closing act featured musicians who were clearly concentrating on their performances but were also greatly enjoying recognition from their peers. As the song faded to a close, the other Music Tech students who had quietly filed into auditorium seats, rose to a standing ovation for the stars of the program. Sub Cellar 6 on stage performing “Confusion.” Image courtesy of NYU Steinhardt. 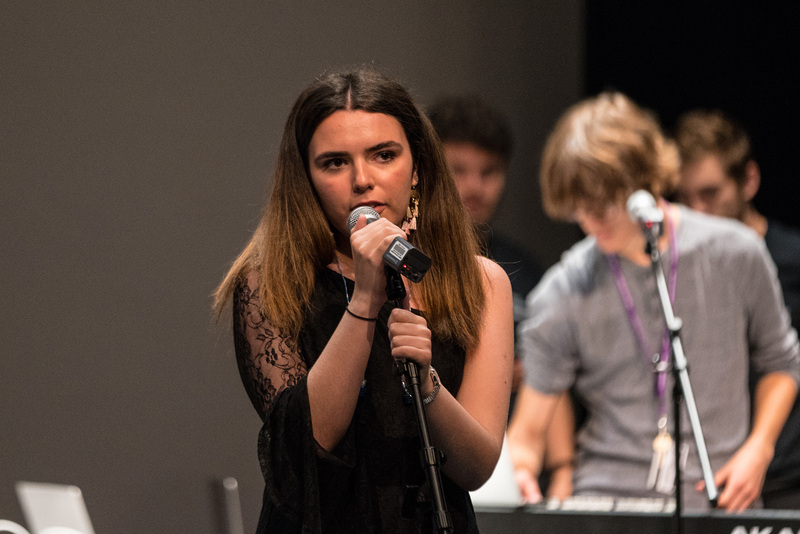 The Music Tech performance showcased what the Steinhardt Music Department’s summer programs have to offer. The easiness and friendliness between the performers onstage, and the camaraderie reflected in their earnest applause for their classmates, proved that the program is a positive social, educational, and artistic experience for these talented and motivated students.